To use HFL, you must first pair your Bluetooth-compatible cell phone to the system while the vehicle is parked. 1. If no phone has been paired to the system before, HFL gives you information about how to pair the first phone. If a phone has already been paired: say “Phone Setup” and “Pair” after the HFL prompts. 2. Follow the HFL prompts and put your phone in discovery or search mode. ► HFL gives you a four-digit code and begins searching for your phone. 3. When your phone finds a Bluetooth® device, select HFL from the options and enter the four-digit code. 2. Say “Edit” after the prompts. 3. 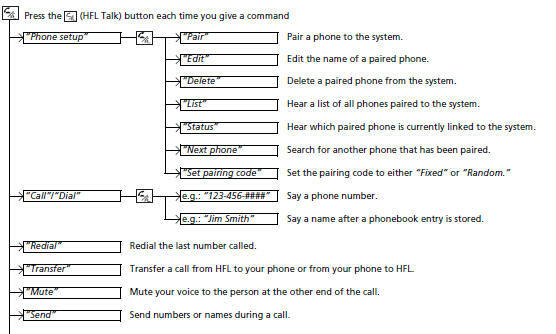 Follow the HFL prompts and rename the phone. 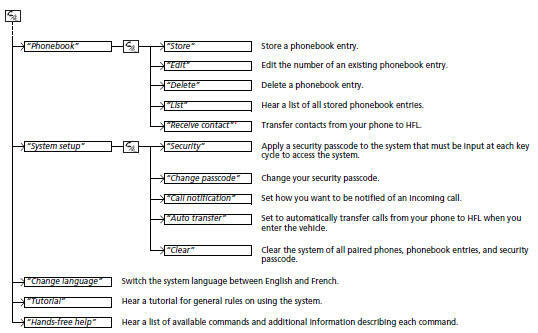 ► If there is more than one phone paired to the system, HFL will ask you which phone’s name you want to change. 2. Say “Delete” after the prompts. ► HFL will ask you which phone you want to delete. beep before giving a command. • Your phone’s battery may drain faster when it is paired to HFL. 2. Say “List” after the prompts. 3. HFL reads out all the paired phones’ names. 2. Say “Status” after the prompts. 3. HFL will tell you which phone is linked with the system. 2. Say “Next Phone” after the prompts. 3. HFL disconnects the current phone, and searches for another paired phone. 4. Once another phone is found, it is connected to the system. HFL will inform you which phone is now linked. 2. Say “Set Pairing Code” after the prompts. If no other phones are found or paired when trying to switch to another phone, HFL will inform you that the original phone is linked again. The “Status” and “Next Phone” commands use: Only one paired phone at a time can be linked to HFL. When there are two or more paired phones in the vehicle, the first paired phone that the system finds is linked. call, or the button to hang up. When there is an incoming call, a call notification (if activated) sounds and a message appears on the display. original call on hold to answer the incoming call. hang up the original and answer the incoming call. You can send numbers and names during a call. This is useful when calling a menudriven phone system. 2. Say the number or name you want to send after the prompts. You can store up to 50 names with their associated numbers in HFL. The numbers you store can be account numbers or passwords. These numbers can be sent to an automated phone system. 2. Say “Store” after the prompts. 3. Say a name you want to list as your phonebook entry. 4. Say the number you want to store for the name entry. 5. Follow the HFL prompts and say “Enter” to store the entry. 3. Say a name you want to edit. When asked, say the new number for that name. • Avoid using duplicate name entries. • Avoid using “home” as a name entry. 3. Say a name you want to delete. 4. Say “Yes,” and follow the HFL prompts. 3. HFL begins reading the names in the order they were stored. 2. Say “Receive Contact” after the prompts. 3. Follow the HFL prompts, select a number from your cell phone, and send it to HFL. 4. Follow the HFL prompts and name the number, or say “Discard” if it is not the number you want to store. 5. Follow the HFL prompts to continue. The call on your cell phone can be automatically transferred to HFL when you get into the vehicle and turn on the ignition switch.